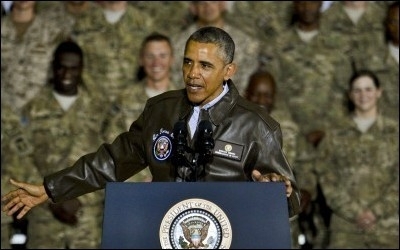 President Barack Obama visits troops at Bagram Airfield, Afghanistan, in May 2014. Barack Obama ran for president promising to end the "bad" war of choice in Iraq and concentrate on the "good" war of necessity in Afghanistan. True to his word, he did everything possible to remove U.S. forces from Iraq, with calamitous results. But his approach to Afghanistan has been far less focused, vacillating between surge and withdrawal, and imposing absurdly restrictive rules of engagement on an already hamstrung military while waging an effective drone campaign to kill individuals. Now in its final months the administration seems as perplexed as ever about how to deal with an ascendant Taliban and still surprised that the latter doesn't want to be a "peace partner." Yet in a recent speech at the Oxford Union, John Kerry cited "the efforts in Afghanistan" as one of "the proudest achievements of the Obama administration." This speech, in which our haughty secretary of state pontificated on "the art of diplomacy," coincided with news of the latest attempts to persuade the Taliban to enter a "peace process." It might also be the harbinger of another bad Obama deal. Obama's approach to Afghanistan has vacillated between surge and withdrawal. Confusion has always prevailed in Obama's Afghanistan policy, starting with a watered-down version of the "surge" Gen. Stanley McChrystal requested when given the job of running the Afghanistan operations. Cracks in the policy appeared when Vice President Biden said that "the Taliban, per se, is not our enemy" in 2011. After McChrystal told a reporter from Rolling Stone what he thought of Biden's military wisdom, the president fired him. In 2013 the administration launched a new program of negotiations with the Taliban, and in 2014 those negotiations led to the Bowe Bergdahl trade. The years since have seen an increase in the already-steady flow of Taliban prisoners released from Guantanamo Bay returning to the jihadist battlefields. So here we are again with another series of negotiations, as announced in the Wall Street Journal on May 23: "Secret Plan Pays Off Taliban." The story describes covert U.S. assistance to a "favored Taliban group" in its struggle against a "rival Taliban group." The favored group is variously described as a "breakaway Taliban faction" and a "Taliban splinter group." Its forces are commanded by Nangialai Khan, and Mullah Rasool is its leader. Obama has a special talent for overinvesting in the good faith of sworn enemies. Trying to leverage one Taliban faction against another is a fine idea, bringing to mind Henry Kissinger's comment on the Iran-Iraq war ("It's a pity both sides can't lose"). But this president has a special talent for misjudging foreign leaders and a history of overinvesting in the good faith of sworn enemies in his gullible quest for "moderates" among Islamists. He has not learned that there is no "good" Taliban, no moderate Taliban, no reasonable Taliban. He does not understand that the entire organization, every branch and splinter group right down to the miserable trunk, is the antithesis of goodness, moderation, and reason. Only those with a history of fighting the Taliban, or who have explicitly renounced the Taliban, should be eligible for consideration as genuine "peace partners" in Afghanistan. Another thing Obama doesn't understand is that the term "Taliban" (like the term "PLO") has become little more than an umbrella, denoting a loose confederacy between many groups. In addition to the original 1994 Kandahar founders (now living semi-openly in Quetta, Pakistan) it also includes the Haqqani network, Tehrek-e-Taliban, Gulbuddin Hekmatyar's Hezb-e-Islami, and many others, all of them enemies. "Negotiating with the Taliban" does not mean the same thing today that it meant prior to 9/11. Navigating through the various factional, regional and tribal iterations of "Taliban" is an incredibly complicated task, one for which this administration has shown no aptitude. Obama's plan to team up with one faction of the Taliban to defeat another should be seen as analogous to FDR hatching a scheme to team up with the Nazis to defeat Imperial Japan. Nevertheless, ever wary of its dubious legacy, the Obama administration is seeking raw material for Ben Rhodes to run through the echo chamber. A "Taliban peace agreement" will provide the opportunity to convert another real-life failure into the verisimilitude of success. The president would do well to recall the fable, often attributed to Aesop, in which a deadly scorpion hitches a ride across a river on the back of a frog, promising not to sting him. When the inevitable sting comes, he tells his incredulous dying victim that he's a scorpion and scorpions sting. Inviting the Taliban to negotiate is like trusting a scorpion not to sting. The Taliban in fact murders those with whom it negotiates. It kidnaps and kills aid workers from around the world and shoots schoolgirls in the face. With perhaps the world's purest record of oppression, the Taliban is a destroyer of culture that pollutes the earth with its very existence. Obama's response? "Let's make a deal."